This city tour is complementary for all registered participants of the ICEC26-ICMC2016 conference. No fee will be charged. The tour includes to and fro travel by bus and entry ticket to the monuments, if any. The journey will tentatively be started after the technical visit of Inter-University Accelerator Centre, New Delhi. 1:30 PM- After lunch, our Bus will pick you up at IUAC Center & then proceed for Half day tour of Delhi. Visit Lotus temple, Humayun Tomb and India Gate. Those who want to avail the Complementary half day Delhi City Tour, Please enroll your name on or before 9th March at 17:00 hrs at Help Desk of Conference Venue. Humayun's tomb is the tomb of the Mughal Emperor Humayun in Delhi, India. The tomb was commissioned by Humayun's son Akbar) in 1569-70, and designed by Mirak Mirza Ghiyas, a Persian architect chosen by Bega Begum. It was the first garden-tomb on the Indian subcontinent, and is located in Nizamuddin East, Delhi, India, close to the Dina-panah citadel also known as Purana Qila (Old Fort), that Humayun founded in 1533. It was also the first structure to use red sandstone at such a scale The tomb was declared a UNESCO World Heritage Site in 1993, and since then has undergone extensive restoration work, which is complete. Besides the main tomb enclosure of Humayun, several smaller monuments dot the pathway leading up to it, from the main entrance in the West, including one that even pre-dates the main tomb itself, by twenty years; it is the tomb complex of Isa Khan Niyazi, an Afghan noble in Sher Shah Suri's court of the Suri dynasty, who fought against the Mughals, constructed in 1547 CE. The Lotus Temple, located in New Delhi, India, is a Bahá'í House of Worship completed in 1986. Notable for its flowerlike shape, it serves as the Mother Temple of the Indian subcontinent and has become a prominent attraction in the city. The Lotus Temple has won numerous architectural awards and been featured in hundreds of newspaper and magazine articles. Like all other Bahá'í Houses of Worship, the Lotus Temple is open to all, regardless of religion, or any other distinction, as emphasized in Bahai texts. The Bahá'í laws emphasize that the spirit of the House of Worship be that it is a gathering place where people of all religions may worship God without denominational restrictions. The Bahá'í laws also stipulate that only the holy scriptures of the Bahai Faith and other religions can be read or chanted inside in any language; while readings and prayers can be set to music by choirs, no musical instruments can be played inside. Furthermore no sermons can be delivered, and there can be no ritualistic ceremonies practiced. The India Gate, (originally called the All India War Memorial), is a war memorial located astride the Rajpath, on the eastern edge of the ‘ceremonial axis’ of New Delhi, formerly called Kingsway. India gate is a memorial to 82,000 soldiers of the undivided Indian Army who died in the period 1914–21 in the First World War, in France, Flanders, Mesopotamia, Persia, East, Gallipoli and elsewhere in the Near and the Far East, and the Third Anglo-Afghan War. 13,300 servicemen's names, including some soldiers and officers from the United Kingdom, are inscribed on the gate. 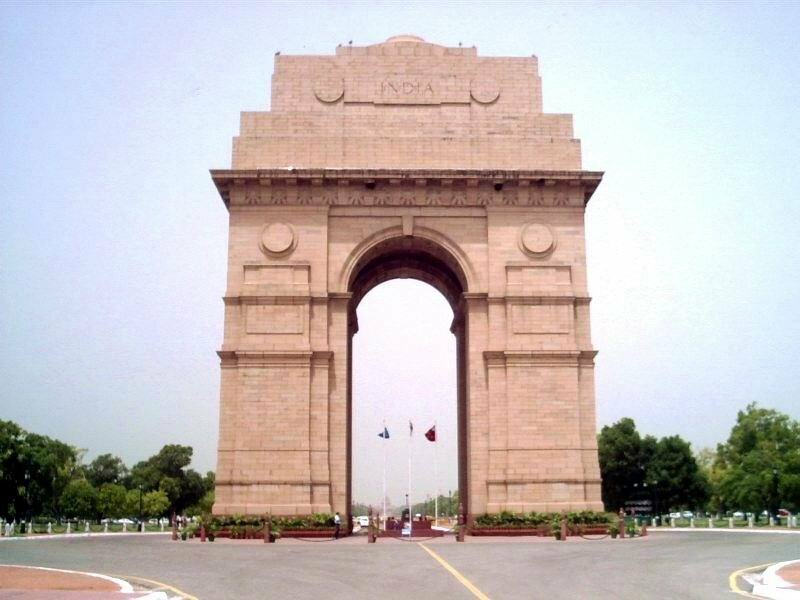 The India Gate, even though a war memorial, evokes the architectural style of the triumphal arch like the Arch of Constantine, outside the Colosseum in Rome, and is often compared to the Arc de Triomphe in Paris, and the Gateway of India in Mumbai. It was designed by Sir Edwin Lutyens. 19:00 Hrs : Bus will drop you at respective Hotels.